My wife, Jennifer, and I met at the University of South Dakota in Vermillion. I was in working on my Master’s in Public Administration, and she was in Dental Hygiene school. I completed my graduate internship in 1998 in the Crime Analysis unit at the police department in Sioux City, IA. Jennifer is originally from Lead, SD. She is the youngest daughter of Wayne and Bonnie King, who owned King’s Grocery on lower Highway 85 in Lead for many years. The King’s still make their famous miner’s meat pies — known as Pasties. Jennifer is employed as a Dental Hygienist here in Rapid City. I grew up on a farm near Boyden, Iowa. Boyden is very small – famous only for its zip code — 51234. My father served for many years as the rural mail carrier for Boyden. 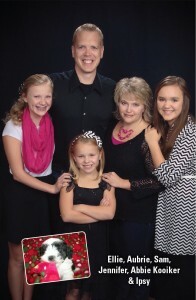 We have three daughters: Abbie (13), Ellie (12) and Aubrie (8). I earned my Bachelor’s Degree in Criminal Justice/Psychology and Master’s Degree in Public Administration from the University of South Dakota. Prior to being elected as Mayor in 2011, I was Operations Manager for Golden West Technologies for six years. I worked eight years for Gateway Computers. In addition, I served as a Vocational Rehabilitation Counselor for the State of South Dakota, working with people with disabilities. I’ve also taught business law on an adjunct basis at Oglala Lakota College. I served on the Rapid City Council from 2002 – 2011. Learn more about my vision and my plan for positive, honest leadership in the Mayor’s office.